Coin Infomercials – What are they selling? 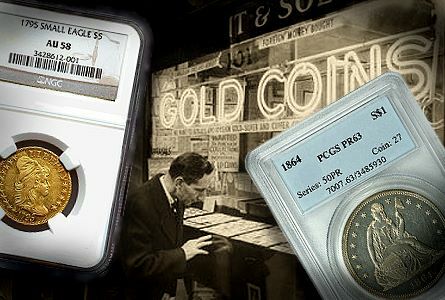 In an effort to clear the air, if not the airwaves, it would be wise for any reader to regard the following guideline with a grain of salt, and that any and all judgments regarding what coins may (or may not) be worth investing in is certainly left to the buyer’s preference and numismatic sense of value and collectability. It should also be pointed out that any viewpoints expressed here are just opinions, and do not reflect any buying preferences for investing in these particular coins, nor are they meant pass judgment on any company or coin offering. These infomercial-driven products represent an immensely popular resource for collectors of all levels of interest and expertise. They certainly reflect an abundance of marketing savvy, as well as a keen commercial insight into what motivates many collectors to make these coins an integral part of their collections. Television shopping channel coin dealers and their premium ‘Mints’ that pervade the airwaves do offer attractive commemorative coins for rather steep prices, but from an investment point of view these collectibles might have minimal worth beyond the bullion value when and if one decides to eventually offer them for re-sale. Some of these ‘Mints’ are usually offered for prices many times higher than the same coin purchased from a coin dealer. In general, these network dealers rarely offer collectible coins that couldn’t be purchased at much less expense somewhere else, so it is wise not to give in to buying on an impulse. Simply doing a bit of internet research will offer up the exact same coin or better, and at just a few dollars over the spot-price, and from any trusted ‘conventional’ coin dealer. The United States Mint has previously put out advisories about this particular company in the past, particularly concerning their ‘Freedom Tower’ coin series. The advertisements suggest or imply that these and other coins contain significant amounts of precious metal, which would suggest a bit of further investigation is warranted. Meanwhile, it should be pointed out the coins that this company ‘mints’ have no connection with the real United States Mint, and therefore it is a good idea to research these coins with respect to their value as either a collectible or investment coin. Next are the products from the Franklin Mint, along with other sources of premium collectible ‘mints’, like the Bradford Exchange being another example. These companies employ rather aggressive marketing campaigns, and do occasionally offer authentic bullion coins, however these coins generally have minimal market value within the established coin collector industry or investors. In most cases, the buyer will pay a substantial premium for say, a one ounce silver coin, that is really worth just the melt-down value of the silver it is made of, and the cost might be well above the prevailing spot-silver price at the time of purchase. Another type of coin in the infomercial category are the aptly named ‘spurious set’ coins. This is also a very popular shopping channel product, as well as being made available in magazines and even flea markets. These ‘spurious sets’ are assembled from lower grade and commonly found coins, and arranged around some type of theme, such as ‘war coins’, or ‘year coins’, or ‘women on coins’, and so on. They are usually made available in attractive plastic holders with some decent, well-designed packaging. While some are certainly the real deal, they are generally over-priced. They may also appreciate in value, and may even reach the price paid for them, though it might be quite some time in terms of a return on the investment. Last but not least are the types of coins that have been ‘modified’, in some way, like authentic U.S. Mint coins that have holographic appliqués or coloring added to their depictions. Bear in mind, even though they may look attractive from an artistic standpoint, or even something that younger collectors might find worthwhile, these coins are often considered questionable or just ‘trendy’ by more dedicated coin collectors, and will only yield their bullion value when re-sold. Dealers have been known to discount these coins because of the added impurities caused by the paint fusing, or otherwise contaminating the metal in the coin. The bottom line, and there is always a bottom line when it comes to investing in coins, is that careful evaluation should be applied as far as ‘coin infomercials’ are concerned. In most cases, the buyer needs to fully investigate exactly what they are paying for, and measure these coin offers for overall collector value and suitability as far as the long-term return on these types of investments. Beyond that, many of these offers can and will add a good amount of character and historical interest to any coin collection, and will certainly reflect a wider scope of mintage diversity within the coin collection as a whole. ©2016 CoinSupplyPlanet.com. All rights reserved.